When Claire first came to me asking me to help her design her wedding programs, I thought “hey that sounds fun!”. I’ve been to a ton of weddings, I’ve planned my own, I can find my way around Photoshop pretty well and I thought “if she hates it she can hire someone else and no harm done right?”. So I said yes. Made the program and she liked it, phew! And then I offered to make more things…and so we made more…lots more and its been so great to see this wedding from a designy perspective. Claire’s wedding has a beautiful navy, mint, and pinky peach theme. The wedding will be held at a stunning winery in Keswick, VA right in Central Virginia’s wine country, Castle Hill Cider. There will also be Duck Donuts…wedding cake shmedding cake gimme the sprinkles! 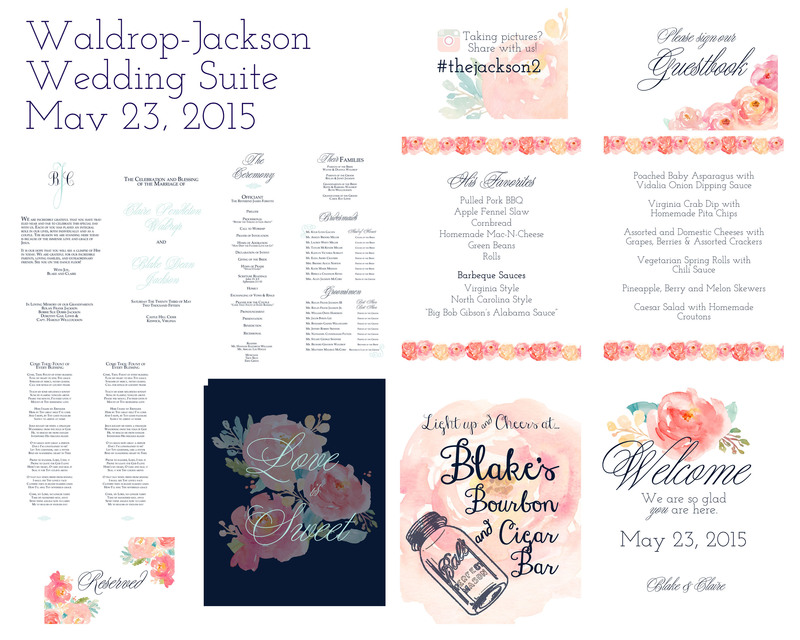 It was such a treat to work on this fun wedding paper suite with such a sweet and stylish new bride.